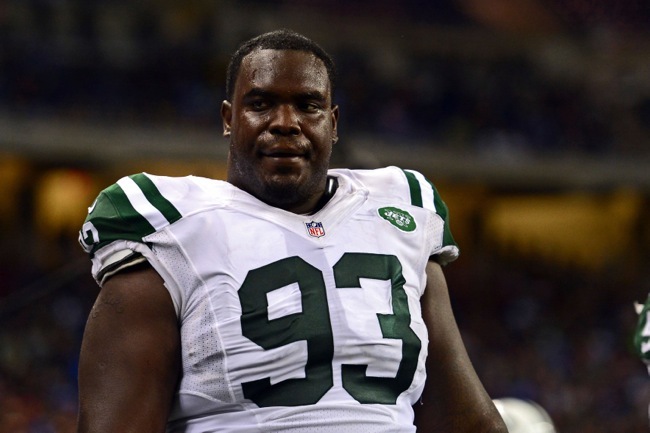 As discussed in our spotlight on defensive tackle Kenrick Ellis, the defensive line of the New York Giants has been in a state of decline. This has been most noticeable at defensive end where the Giants have seen the deterioration and departure of Osi Umenyiora, Justin Tuck, and Mathias Kiwanuka, not to mention the roller coaster productivity of Jason Pierre-Paul. 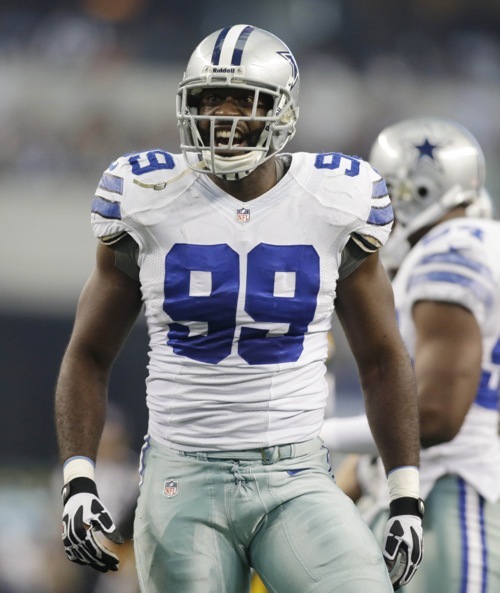 To help reinforce this unit, the Giants signed unrestricted free agent George Selvie from the Dallas Cowboys on March 20. The contract was reportedly a 1-year, $1.4 million deal that included a $200,000 signing bonus. The 28-year old Selvie was a collegiate teammate of defensive end Jason Pierre-Paul at the University of South Florida. And it is Selvie, and not JPP, who holds school records for career sacks, sacks in a season, and tackles for a loss in a season. In 2007, Selvie was named “Big East Defensive Player of the Year” when he accrued 14.5 sacks. Indeed, at one time, Selvie was considered a better pro prospect than Pierre-Paul. But not by the Giants and the rest of the NFL. While Pierre-Paul was drafted in the 1st round of the 2010 NFL Draft by the Giants, Selvie fell to the 7th round where he was drafted by the St. Louis Rams. The head coach of the Rams at the time was Steve Spagnuolo. Selvie only lasted one season with the Rams. He played in all 16 games as a rookie and finished the year with 21 tackles and 1.5 sacks. Spagnulo waived Selvie in early September 2011 before the regular season started. Selvie was immediately claimed by the Carolina Panthers but then waived a month later after playing in four games as a backup. A month after that, in November, he was signed by the Jacksonville Jaguars, where he played in seven games as backup. In all, Selvie finished the 2011 season with only six tackles and half a sack. Selvie missed the first five games of the 2012 season with a knee injury. When he returned, Selvie played in nine games as a reserve for the Jaguars, collecting 15 tackles and one sack. The Tampa Bay Buccaneers signed Selvie as a free agent in April 2013 after the Jaguars decided not to tender him. However, Tampa Bay became the fourth NFL team to cut ties with Selvie when they released him a month later. It was at this point in time where there would occur another connection between Selvie and the Giants. After being cut by Tampa Bay, Selvie was invited to try out at the Giants rookie mini-camp in May 2013. However, Selvie did not do enough to impress the team and he was not offered a contract. At the time, that looked like the last hurrah for Selvie. But two months later, the Dallas Cowboys signed him after their training camp opened. Defensive end Anthony Spencer was having knee issues and defensive end Tyrone Crawford had just tore his Achilles. Although Selvie was not expected to make the team, the Cowboys were desperate for bodies. However, Selvie did more than that as he quickly earned first-team reps and was named the starter at left (strongside) defensive end in the preseason. Selvie’s productivity in Dallas declined in 2014. He played in all 16 regular-season games with 13 starts at left defensive end. He also started both playoff games for the Cowboys. Selvie finished the regular season with 30 tackles, three sacks, one forced fumble, and one fumble recovery. He added six post-season tackles, including five against Green Bay. Selvie was credited with 20 quarterback pressures in the regular season, down by just two from 2013. And he continued to cause problems for the Giants, sacking Eli again and being credited with eight tackles in two games against Big Blue in 2014. When Dallas signed one of the better defensive ends in free agency in Greg Hardy in March 2015, Selvie became expendable. The Giants and Tampa Bay Buccaneers – two teams that had already looked at him just two years earlier and had rejected him – were both interested once again. 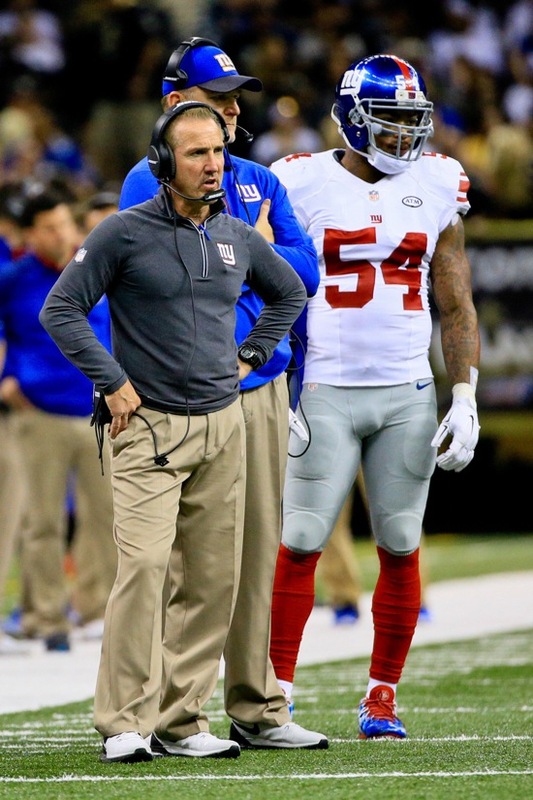 Selvie signed with the Giants, whose new defensive coordinator, Spagnulo, had also previously waived Selvie. “I’m excited to be here,” Selvie said. “It’s a great opportunity for me. And I’m excited to be playing with JPP again, along with Spags. I’m excited for the opportunity to be here. Pierre-Paul also appears thrilled to be playing with his old collegiate teammate. So how does Selvie fit in with the Giants? 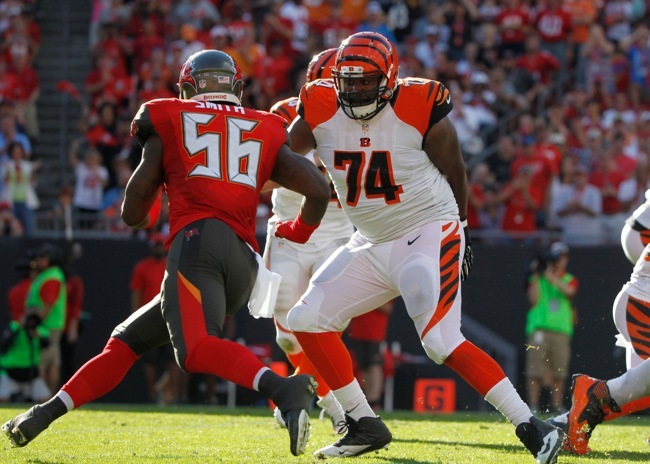 At 6’4”, 270 pounds, the journeyman Selvie has demonstrated an ability to be a decent run defender at left end, where he has started 31 regular- and post-season NFL games since 2013. He also has 10 sacks and 42 quarterback pressures in the last two regular seasons. That alone gives him a decent shot a starting job at strongside end if the Giants choose to keep JPP at weakside end. Selvie will compete with Damontre Moore, Robert Ayers, and Kerry Wynn – along with any potential 2015 draft pick – for a starting job. No one yet has the inside track. The big question is what is Selvie’s upside? Was 2013 his career year for a journeyman now with his sixth team? Is he the kind of guy you look to replace, or can become a valuable starter or reserve in New York? That remains to be seen. Like a bad penny, Selvie keeps turning up. Spagnulo, the Buccaneers, and Giants all wanted him back after cutting ties. At the very least, it will be interesting to see if Selvie’s presence on the team has an impact on JPP’s mental outlook and overall game. As discussed in our free agent spotlight on linebacker Jonathan Casillas, the New York Giants have been forced to upgrade the linebacker position in free agency because of their failed attempts to do so from the college ranks. After four seasons, the Giants decided to part ways with Jacquian Williams and Spencer Paysinger and sign Casillas from the New England Patriots and J.T. Thomas from the Jacksonville Jaguars. The Giants signed 26-year old J.T. Thomas in March 2015 to a 3-year, $10 million deal that included $4.5 million in guaranteed money and $1 million escalators in 2016 and 2017. Thomas – a three-year starter at the University of West Virginia – was originally drafted in the 6th round of the 2011 NFL Draft by the Chicago Bears. He spent his entire rookie season on Injured Reserve after suffering a hip injury in the preseason. In February 2012, Thomas was arrested on a misdemeanor drug possession charge (marijuana). He played in all 16 games for the Bears in 2012, but did not start and finished the season with six special teams tackles and one forced fumble. The Bears waived Thomas in August 2013. He was immediately claimed off of waivers by the Jacksonville Jaguars. 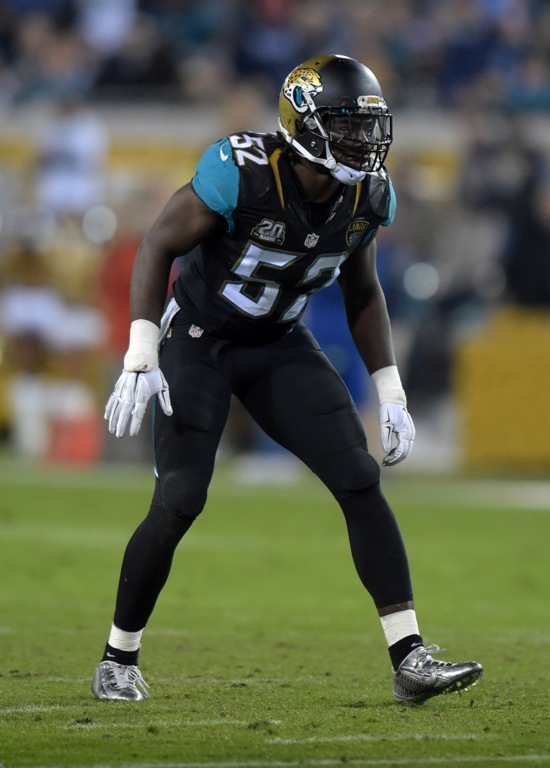 Thomas played in 15 games with the Jaguars in 2013, starting two contests and finishing the season with 17 tackles (12 solo) on defense and six special teams tackles (third on the team). Thomas also blocked a punt that resulted in a safety. Thomas remained a back-up at the beginning of the 2014 season, but started the last 10 games of the year at middle linebacker after Paul Posluszny got hurt. He finished the season with 84 tackles, two interceptions, and two forced fumbles. “I really like J.T. Thomas,” said Jacksonville Jaguars’ Head Coach Gus Bradley after the Giants signed Thomas. “Really, the good thing about J.T. is flexibility. He played at all three positions for us. He can go in at all three positions at any time and play extremely fast, as far as knowing what he’s supposed to do. In the week 13 match-up against the Giants, Thomas finished the game with 12 total tackles and a fumble recovery for a touchdown. Head Coach Tom Coughlin pointed to that game as a significant factor in the team’s evaluation of Thomas, who also had double-digit tackle numbers in games against the Colts and Titans. Despite that productivity, the Jaguars still saw Thomas as back-up material as the team signed Dan Skuta from the San Francisco 49ers to start along side Posluszny and Telvin Smith. Right or wrong, the Giants seem to think Thomas can be a viable NFL starter too, ideally at weakside linebacker to replace Jacquian Williams. On the surface, this does seem to be his best position given his size (6’1” and 236 pounds) and overall athletic ability (4.65 speed). The Giants also think Thomas will improve their special teams. Thomas lacks ideal size, but is a good athlete. In a nutshell, he is a run-and-hit linebacker who is at his best when he is protected and does not have to take on blockers at the point-of-attack. Thomas is intense, instinctive, and involved in a lot of tackles. While Thomas is not afraid to stick his nose into the scrum, he is not a strong or physical player. He won’t shock you as a hitter, and many of his tackles are of the down-the-field variety. Thomas is good in coverage and should help the New York defense deal with the plethora of tight end and running back receiving threats in today’s NFL. In terms of intangibles, Thomas has some off-the-field issues in his past. Aside from the drug charge, in college, Thomas was arrested for being involved with a stolen laptop. On the flip side, he is known for his charity work with children with medical issues. Thomas also has the reputation for being a hard worker and team leader. His on-field personality is demonstrated when he was mic’d up in a December 7, 2014 game against the Houston Texans. How does J.T. Thomas fit in with the Giants? He is probably the favorite to start at the weakside linebacker spot though he will face competition from Jonathan Casillas. At worst, he could be a valuable reserve as he can play all three linebacker spots and is a good special teams player. The big question with Thomas is what is his upside? Jacquian Williams was the heir apparent to Michael Boley but he couldn’t handle the job. Is Thomas another placeholder or can he be a 4-5 year starter at the position? Thomas wanted the opportunity to prove himself, and now he has it. He seems to be a hungry player. When the free agent period officially opened on March 10, the New York Giants moved quickly to sign five players. 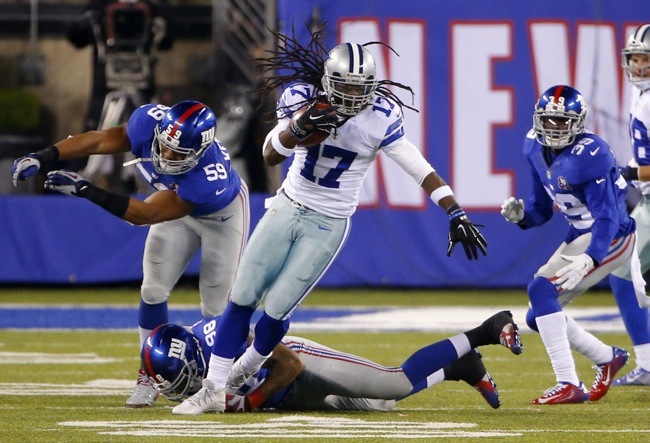 Wide receiver and returner Dwayne Harris of the Dallas Cowboys was one of the five. And surprisingly, Harris’ 5-year, $17.5 million deal was by far the largest in terms of the number of years and overall value. Harris also received the largest amount in guaranteed money ($7.1 million with a $4 million bonus). On the surface, that appears to be a lot of money for Dallas’ 4th wide receiver/back-up slot receiver and punt/kickoff returner. The 27-year old Harris was originally drafted in the 6th round of the 2011 NFL Draft by the Cowboys. In four seasons with the Cowboys, Harris has played in 52 regular-season games with three starts, catching 33 passes for 418 yards and three touchdowns. Harris finished 2014 with just seven catches for 116 yards and no touchdowns, down from nine catches in 2013 and 17 catches in 2012. Harris also averaged 9.2 yards per punt return and 24.7 yards per kickoff return in 2014. Those decent but not stellar figures were 9th- and 13th-best in the NFL last year. So why the big bucks for a guy who has been only a good role player to date? Harris indeed was far more impressive on special teams in 2013 as he averaged 12.8 yards per punt return and 30.6 yards per kickoff return. Those figures were 3rd- and 2nd-best in the NFL that season, helping him to earn “NFC Special Teams Player of the Week” twice, including once against the Giants. Harris also won another another “NFC Special Teams Player of the Week” honor in 2012 against the Philadelphia Eagles. That season, Harris averaged 16.1 yards per punt return, 2nd best in the NFL. Harris returned punts for touchdowns in both 2012 and 2013. Bringing him on board strongly suggests that the Giants do not want to risk Odell Beckham on punt returns. On the downside, he Harris six career fumbles on punts, including four in 2014. Ball security has been an issue for him going back to his college days at East Carolina. Harris’ contributions on special teams are not limited to the return game. Harris is an excellent coverage man on special teams. Indeed, it was Harris’ coverage work against the Giants on opening day in 2013 that earned him the “Special Teams Player of the Week” award. In that game, Harris made three special teams tackles and forced a fumble that was recovered by Dallas. In 2014, Harris was credited with 18 special teams tackles – a very high number. But $17.5 million with $7.1 million in guaranteed money still seems like a lot of money for a special teams player. Could the Giants see Harris as a bigger contributor at wide receiver than his 33 career catches to date indicate? Assuming everyone stays healthy, the top three receivers on the Giants should be Beckham, Victor Cruz, and Rueben Randle. Since Harris is experienced playing the slot receiver position, the Giants may consider Harris to be an insurance policy if Cruz struggles or re-injures himself. Preston Parker was the reserve slot guy in 2014, finishing with 36 catches for 418 yards and two touchdowns. Parker also returned both punts (6.6 yard average) and kickoffs (24.2 yard average) for the Giants in 2014. The Giants might see Harris as an upgrade over Parker not just as a returner, but as a receiver. Heading into the offseason, the Cowboys felt they could re-sign wide receiver Cole Beasley or Harris, but not both. Harris provided more special teams value, but Beasley is the primary slot receiver for the Cowboys. Dallas re-signed Beasley with a 4-year, $13.6 million contract that included $7 million in guaranteed money and a $4 million signing bonus. As soon as that deal was done, Harris was sure to sign elsewhere. Harris has flashed at receiver. While he is not a big (5’10”) or exceptionally fast (4.5 range) target, Harris is a solid 202-pounder with good quickness and run-after-the-catch ability. He is tough and physical and an excellent blocker for the ground game, something repeatedly mentioned by those who followed him in Dallas. It was anticipated by many New York Giants fans that the team would aggressively pursue one of the more highly regarded (or recognizable) names in free agency for the much-maligned offensive line. There was speculation that the Giants might attempt to sign guard Mike Iupati (49ers), tackle Bryan Bulaga (Packers), or guard/tackle Orlando Franklin (Broncos) among others. But those players did not seem to appear on the team’s radar scope as there were no reports of visits or even interest. In the end, the Giants did move quickly to sign one offensive lineman on the opening day of free agency. However, it was a surprise candidate and one that did little to excite: Marshall Newhouse, who was signed to a 2-year, $3 million contract from the Cincinnati Bengals. The scouting reports on Newhouse coming out of college in 2010 were mixed. He was a three-year starter at left tackle at TCU. While Newhouse has good bulk (325+ pounds), he lacks ideal height (under 6’4”). Newhouse tested very well athletically for a big man, tying for the best three-cone time (7.4 seconds) at the NFL Combine, demonstrating very quick feet. However, because of his “dumpy” body and lack of functional football strength, combined with his lack of proper technique and leverage, Newhouse was regarded as a mid-to-late round “developmental” prospect. The most severe pre-draft criticism was that he was a soft, passive, and inconsistent player who alternated between good and poor play. Some thought his best position might be guard, while others thought he might be over-drafted based on his measurables and not his on-field performance. The Green Bay Packers drafted Newhouse in the 5th round of the 2010 NFL Draft, being picked 169th overall. Newhouse did not play in any games as a rookie. But the “developmental” prospect became a factor quicker than expected in 2011 when he ended up starting 10 games at left tackle for the injured Chad Clifton and three games at right tackle for the injured Bryan Bulaga. While Newhouse had his issues at times in pass protection, he played better than expected for a team that finished the regular season 15-1 before being knocked out of the playoff by the Giants in the NFC divisional round. “I think (Newhouse) has the personality makeup to (be our left tackle of the future), the athletic ability to do that, the feet and the smarts to be a very, very solid left tackle for us,” said Packers’ quarterback Aaron Rodgers in December 2011. In 2012, Newhouse started all 18 of the Packers’ regular-season and post-season games at left tackle. But the Packers were not thrilled with Newhouse’s play and the plan was to upgrade at that position by moving shifting 2010 1st round pick Bulaga to left tackle. Newhouse simply wasn’t a very physical run blocker and he was still making too many mistakes in pass protection, resulting in sacks, pressures, and holding penalties. Entering the 2013 training camp, it was anticipated that Newhouse would have a good chance to win the starting right tackle job. But he lost the job to undrafted second-year man Don Barclay. And although Bulaga tore an ACL in training camp, the Packers chose to start rookie 4th rounder David Bakhtiari at left tackle instead of re-installing Newhouse at the position. Newhouse became the primary back-up at both tackle spots, though he did start two games at right tackle in November, including one against the Giants. In 2014, Newhouse signed with the Cincinnati Bengals as an unrestricted free agent. He did not win a starting job but became the primary back-up tackle. However, Newhouse struggled when forced to start at right tackle for three games due to an injury to Andre Smith and was benched due to his poor play. In particular, Marshall was terrible in a Week 10 game against the Cleveland Browns where he almost got Bengals’ quarterback Andy Dalton killed. Bengal fans felt it was an upgrade for their offensive line when he signed with the Giants. Overall, Newhouse has played in 62 regular-season games with 36 starts (26 of those starts coming at left tackle in 2011-12). But it is important to note that he lost starting tackle jobs with the Packers during the 2013 preseason and the Bengals during the 2014 regular season. And both fan bases were glad to see him sign with other teams. Newhouse remains the what he was coming out of college: an intriguing size-athletic physical specimen who is simply too finesse a run blocker and too inconsistent a pass blocker. On the plus side, Newhouse does bring versatility to the table as he can play either tackle position. And despite being only 26 years old, he has already has a lot of starting experience. Ben McAdoo was also on the Packers’ coaching staff during all four years of Newhouse’s stay with Green Bay, so one would assume McAdoo still sees something in the offensive lineman. 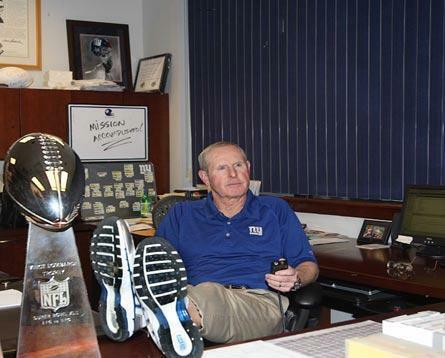 “(McAdoo) was a big part (of my decision to join the Giants),” Newhouse said. “It is good to always have familiarity, and he knows what I can do. I am just looking forward to proving him right and then some. So what will Newhouse’s role be on the Giants? It is most likely that Jerry Reese and Tom Coughlin envision as the primary reserve tackle behind Will Beatty at left tackle and Justin Pugh (or whomever starts) at right tackle. In effect, he has replaced James Brewer on the roster. But Newhouse failed miserably in that same role with the Bengals when called upon to play in 2014. It remains questionable at best if Newhouse can reinvigorate his career with his third team in three years. Inconsistent veterans usually don’t become more magically consistent. And soft linemen hardly ever change their stripes and become tougher and more physical players. The Giants signed offensive tackle Charles Brown in free agency last offseason. He was supposed to provide veteran depth too, but the Giants ended up cutting Brown in November. Hopefully history doesn’t repeat itself here with Marshall Newhouse. Linebacker has been a sore spot for the New York Giants for quite some time. The Giants have had to rely on free agent acquisitions and a trade to beef up a unit that the team has been unable to satisfactory address in the draft. After four seasons with the team, the Giants apparently have given up on 6th round draft pick Jacquian Williams and undrafted rookie free agent Spencer Paysinger. To fill these vacancies, the Giants signed unrestricted free agents J.T. Thomas from the Jacksonville Jaguars and Jonathan Casillas from the New England Patriots. The 27-year old Casillas was originally signed as an undrafted rookie free agent by the New Orleans Saints after the 2009 NFL Draft. He has played for the New Orleans Saints (2009-11), Tampa Bay Buccaneers (2013-14), and Patriots (2014). In 2014, Casillas played in five games for the Buccaneers before being traded to the Patriots in late October. 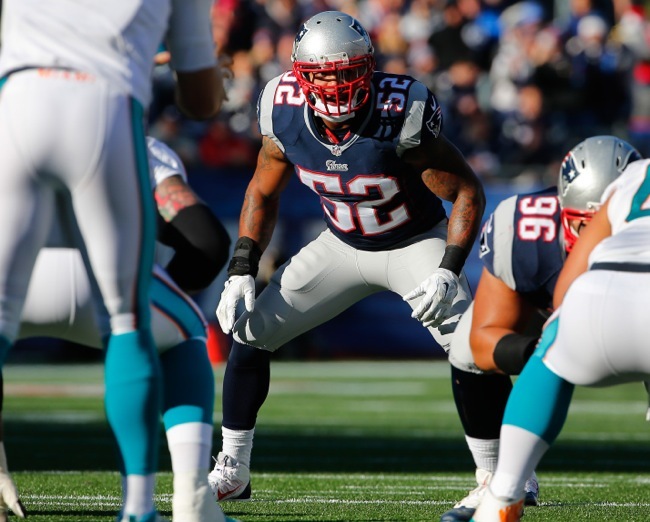 In eight games for the Patriots with three starts, Casillas accrued 28 tackles and forced one fumble. Casillas is a local talent, having been born in Jersey City and going to high school in New Brunswick. He has played on two Super Bowl championship teams: the Saints (2009) and Patriots (2014). After arriving in New England in mid-season, Casillas was mainly a back-up pass coverage specialist and core special teams player for the Patriots. Casillas signed a 3-year, $8 million contract with the Giants on March 10. He has already been given Paysinger’s #54 jersey number. In five seasons, Casillas has played in 64 regular-season games with 18 starts. He missed the entire 2010 season with a foot injury that he suffered in the preseason. At 6’1”, 227 pounds, Casillas is an undersized linebacker. But he is an excellent athlete with good speed and agility for the position. Indeed, when he came out of college at the University of Wisconsin, there was some talk he might be better suited to the safety position at the pro level. As you would expect for such a linebacker-safety ‘tweener, Casillas is good in pass coverage and special teams. Against the run, while he has good instincts and range, he is not a physical player and he can have trouble at the point-of-attack due to his lack of size. He is a solid tackler. Casillas only has three career sacks, all three coming in 2011 with the Saints. Despite being very sound in pass coverage, Casillas does not make many plays on the ball. He has never intercepted a pass at the pro level and only has five career pass defenses. As for his role with the Giants, Casillas will compete for a starting outside linebacker spot, but he most likely will be a situational pass coverage linebacker. That is an important role in today’s pass-happy NFL that features athletic receiving threats at running back and tight end. He is a guy who can match-up against tight ends and backs split out wide or in the slot. Casillas should also become one of the Giants’ better special teams players. He has 22 career special teams tackles in 70 regular- and post-season games. He recovered an onside kick in Super Bowl XLIV. As the New York Giants entered 2015 NFL free agency, it was anticipated that the team would pursue a quicker, shiftier running back with pass receiving skills in order to compliment the bigger bruisers, Rashad Jennings and Andre Williams. The Giants signed arguably the best candidate on the open market in Shane Vereen to a 3-year, $12.35 million contract that included $4.75 million in guaranteed money. Vereen has been favorably compared to another former Patriot all-purpose back: Kevin Faulk. For Giants fans unfamiliar with Faulk’s body of work, think David Meggett, who ironically signed with the Patriots as a free agent in 1995. While many remember Meggett for his special teams kickoff and punt return exploits, Meggett was also a major component in the Giants offense from 1989 to 1994. On a team that did not emphasize the short passing game, Meggett not only rushed for 1,228 yards and five touchdowns, but more importantly he caught 231 passes for 2,194 yards and 10 touchdowns. He kept the chains moving for Phil Simms and Jeff Hostetler, and at times provided the big play. If he stays healthy, Vereen should put up bigger numbers for the Giants. 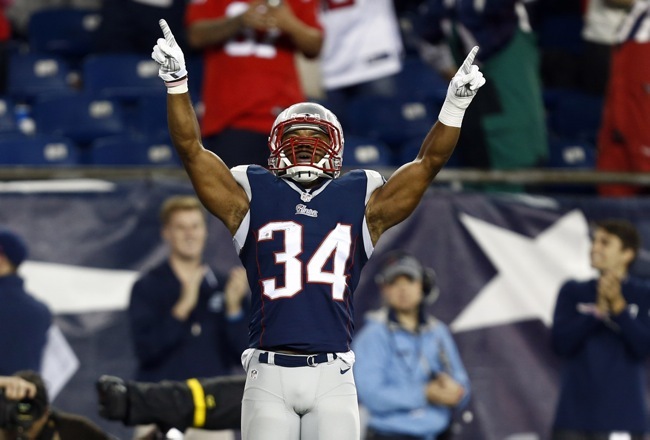 In the last two seasons in New England, Vereen caught 99 passes despite missing half the year in 2013. In the Giants West Coast-style offense under Ben McAdoo, the running back is a featured component in the passing game, not only as a check-off option when other targets are covered, but as a primary receiver. The West Coast offense is designed to exploit the field not only vertically, but horizontally, exploiting holes in defensive coverages. Vereen is a smaller, shiftier back who is a match-up problem for most linebackers. If teams focus their attention on Odell Beckham and Victor Cruz – as they should – then Vereen could feast against the underneath coverage. What makes Vereen such a good receiver is not just his athletic ability and hands, but he is a precise, trustworthy route runner. He doesn’t make mental mistakes. And his skill set allows him to not only catch shorter passes on dig, drag, swing, and screen passes but also deeper routes where his split out wide like a conventional wide receiver. Indeed, there are times when the observer will understandably initially confuse Vereen for a wide receiver because of his route-running and pass-catching adeptness. He is like having another legitimate wideout on the field. Vereen has pass receptions of 83, 50, and 49 yards in the past three seasons. What will be interesting to see is how the Giants use Vereen. Under Kevin Gilbride, Vereen probably would have been limited to a third-down back. But in Ben McAdoo’s system, although Vereen won’t be a conventional “starter”, he should see the field much more on first and second down, depending the opponent and game plan. There are those who say it does not matter how good a pass catcher Vereen is because Eli Manning doesn’t have a good feel for throwing to running backs. While this certainly isn’t the strength of Manning’s game, the numbers don’t support that argument. When Eli had Tiki Barber, Barber was a favorite target of Eli’s, catching 54 passes in 2005 and 58 passes in 2006. Derrick Ward caught 41 passes from Eli in 2008 and Ahmad Bradshaw 47 passes in 2010. Despite being limited to 11 games with just nine starts, Jennings caught 30 passes from Manning in 2014. What these figures demonstrate is that even in an offense that was more vertically-oriented, Manning has productively thrown to running backs when the talent is there. Another important component to Vereen’s game is that he does a good job or recognizing and picking up blitzes despite his lack of size. He has only fumbled twice in his pro career, losing one. Vereen usually will not wow you as runner. He has good quickness and speed, but he is not a dynamic breakaway threat. His longest run from scrimmage at the pro level is only 21 yards. And at 5’10 and 205 pounds, he is not going to run over a lot of defenders. But Vereen can be a factor in the running back, especially out of the shotgun formation that McAdoo likes to employ. In his last two seasons in New England, Vereen ran the ball 140 times for 599 yards (4.3 yards per carry) and three touchdowns. Perhaps the biggest negative on Vereen is that in three seasons, he has only played a full 16-game schedule once. And that was in 2014. He missed 11 games in 2011 with hamstring issues, three games in 2012 with a foot injury, and eight games in 2013 with a fractured wrist. Obviously, for a New York Giants team that has been ravaged by injuries in recent years, Vereen’s injury-plagued past is a bit disconcerting. But if Vereen stays healthy, it is not unreasonable to project him as a 50+ catch target in the New York offense. He should become a key figure in keeping drives alive and therefore increasing overall offensive productivity and scoring. Keeping drives alive will allow more opportunities for Manning, the wideouts, and the running backs. In the simplest terms, Vereen will make the New York Giants a much better offensive football team. 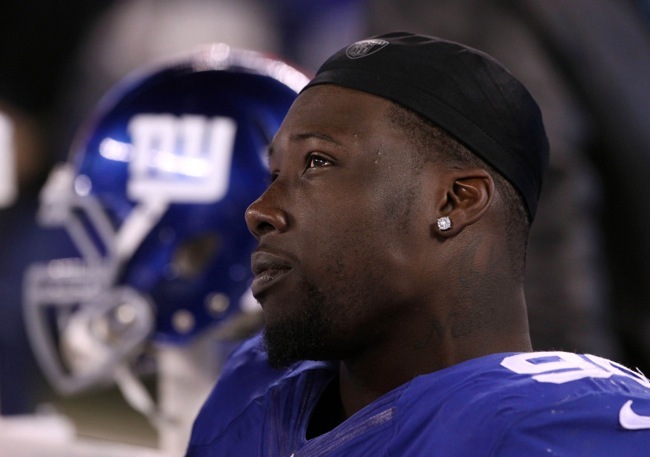 Will the Giants Use the Franchise Tag for Jason Pierre-Paul? The New York Giants must decide soon whether or not to use the Franchise or Transition tag on soon-to-be unrestricted free agent defensive end Jason Pierre-Paul. Starting today (February 16), NFL teams have a two-week window to decide on to designate Franchise or Transition players about to become unrestricted free agents. That window closes on March 2. Other teams can begin negotiating with free agents on March 7 and sign the to contracts on March 10. A “non-exclusive” franchise player must be offered a one-year contract for an amount no less than the average of the top five salaries at the player’s position for the previous year, or 120 percent of the player’s previous year’s salary, whichever is greater. A non-exclusive franchise player may negotiate with other NFL teams, but if the player signs an offer sheet from another team, the original team has a right to match the terms of that offer, or if it does not match the offer and thus loses the player, is entitled to receive two first-round draft picks as compensation. Teams can also use a Transition tag, which also guarantees the original club the right of first refusal to match any offer the player may make with another team. The transition tag can be used once a year by each club. A transition player must be offered a one-year contract for an amount no less than the average of the top 10 salaries of last season at the player’s position or 120 percent of the player’s previous year’s salary, whichever is greater. A transition player designation gives the club a first-refusal right to match within seven days an offer sheet given to the player by another club. If the club matches, it retains the player. If it does not match, it receives no compensation. The upside to using a Franchise tag on Pierre-Paul is that the team could ensure that he remains with the Giants in 2015. The downside is he would count for about $15 million against the 2015 salary cap. In his fifth NFL season, Pierre-Paul had his second-best season in 2014, starting all 16 games and finishing with 77 tackles, 12.5 sacks, six pass defenses, and three forced fumbles. Pierre-Paul played the run well most of the year and finished up strong as a pass rusher after a slow start, with nine of his sacks coming in the last five games of the season. Pierre-Paul was originally drafted in the 1st round of the 2010 NFL Draft. His best season came in 2011 when he accrued 86 tackles and 16.5 sacks. 2012 and 2013 were down seasons for him with a total of only 8.5 sacks. Pierre-Paul had surgery in June 2013 to repair a herniated disc in his lower back and suffered a shoulder injury that caused him to miss the last five games of that season. 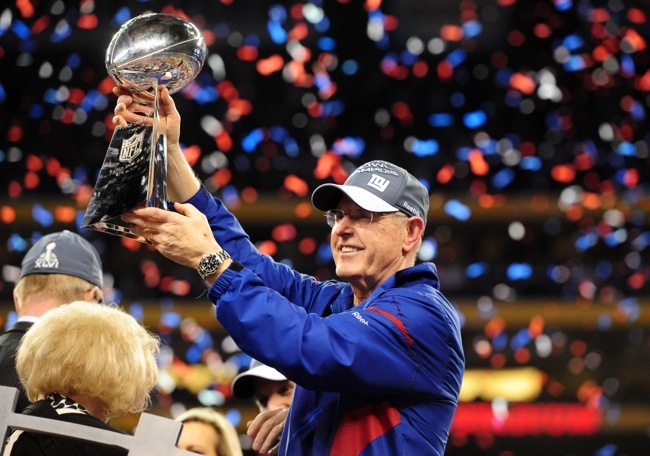 The Giants have used the Franchise tag twice in recent years, once for running back Brandon Jacobs in 2009 and once for punter Steve Weatherford in 2012. But both were signed to long-term deals soon after being tagged.